The Duke of Marlborough was dismissed from the office of captain-general on December 31st 1711. 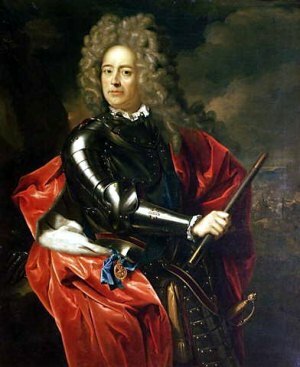 The great Duke of Marlborough won famous victory after famous victory against the French in the War of the Spanish Succession in the early 1700s, but he relied for support at home on shifting alliances between groups of Whigs and Tories in Parliament and on his wife Sarah’s influence as the best friend of Queen Anne. Weariness with the war and misgivings about its cost developed as peace talks with the French failed in 1709 and again in 1710; meanwhile Sarah and Anne fell out. A new Tory administration took office in 1710. Determined on peace with France, it persuaded the queen that it was necessary to get rid of Marlborough and she dismissed him from the office of captain-general at the end of 1711. The excuse was an accusation that he had used his position to line his pockets by taking a commission from suppliers of bread to the army and by deducting pay from the wages of foreign soldiers. He defended himself vigorously, but Parliament condemned him. Viciously attacked by Jonathan Swift among others, he decided to leave the country. In December he took the packet boat to Ostend where he was greeted on arrival by large crowds and a salute of cannon. He went on by way of Antwerp and Aachen to Maastricht, hailed all the way by admiring crowds. Sarah joined him in February. She had several servants and a chaplain with her, as well as quantities of luggage which included 40 cloaks and petticoats, seven muffs made of leopard skin, a chocolate pot and a capacious tea kettle. The Marlboroughs went on to reach Frankfurt in May. They settled down there and Sarah criticised her husband for being unbearably lazy as the months dawdled by. The duke did, however, prudently take care to keep in touch with the Elector of Hanover, the heir to the English throne (and with the Jacobites, too, just in case). Word came that Queen Anne was seriously ill and the Marlboroughs moved to Antwerp to be closer to England and possible developments. Britain and the Dutch Republic made peace with France by the Treaty of Utrecht in 1713. When the Tory administration in England began to fall to pieces the duke decided the time was ripe to return and he and Sarah arrived at Dover from Ostend at the beginning of August 1714, on the day after Queen Anne died. Her successor, George I, restored Marlborough to his office of captain-general, but the duke’s health was beginning to fail and he suffered a succession of strokes that finally carried him off in 1722, less than a month after his 72nd birthday. Sarah lived on until 1744, formidable to the last.